Junior explorer Meteoric Resources (ASX:MEI) has entered into an agreement to acquire 100% of the Gillies Cobalt Project in Ontario, Canada. The project consists of 11 contiguous claim blocks within the prolific Cobalt Camp mining district. It’s located on the same geological trend, and within just 2.5 kilometres, of numerous historical high-grade cobalt and silver mines. Nearby projects include the Cobalt A-53 mine, the Silver mining company mine (produced 2,251 lbs of cobalt), the Provincial mine (34,473 lbs cobalt & 287 lbs silver), and the Waldina silver mines shaft (2,066 lbs cobalt). 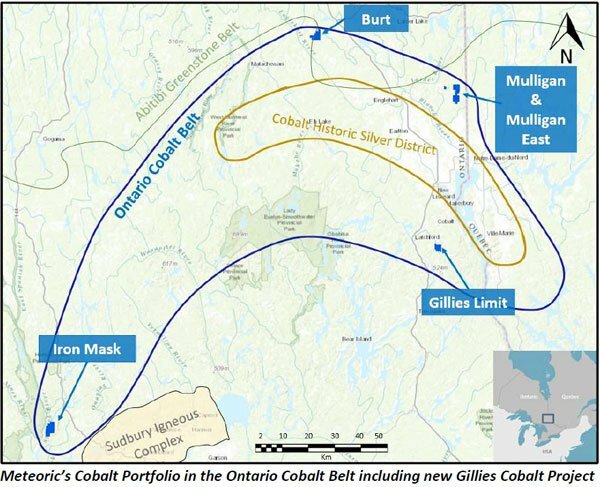 The Gillies township alone has produced more than 60,000 pounds of cobalt and over 33 million ounces of silver making up a significant proportion of the production from the prolific Cobalt Camp. Recent grab samples at the Gillies Cobalt Project yielded high-grade cobalt assays up to 1.6% cobalt. Cobalt mineralisation within the Gillies Claims is hosted within the Nippising Diabase which outcrops in the western portion of the property, where it dips east beneath sedimentary sequences belonging to the Cobalt Group. In the Cobalt Camp, considerable cobalt-silver mineralisation typically is encountered in the diabase sill below the contact with Cobalt Group sediments. Historically between 80-90% of the cobalt ores were extracted from the Huronian conglomerates that are in contact with the diabase intrusion. The Gillies Project hosts both the lower and upper sill contacts, with both contact zones having the potential to host cobalt and silver mineralisation. Most historic workings in the area targeted the upper contact of the diabase, leaving the lower contact zone relatively underexplored. The area’s prospectivity, and potential to host significant cobalt mineralisation given the considerable exposed lengths of the upper and lower contact zones, are encouraging. There are numerous surface cobalt-silver showings that are associated with two major northerly- and northwesterly-trending faults. The company plans to resample the extensive historic workings with the major focus being on primary cobalt mineralisation. Prospect scale mapping and surface sampling, as well as a detailed geophysical survey (Induced Polarisation, Magnetics & Radiometrics) is planned for as soon as the weather allows. MEI will also conduct additional trenching to determine the extent of the previously exploited veins and is hoping to produce a bulk sample for analysis along with preliminary metallurgical test work. The company also plans to fast track its systematic and rigorous exploration approach with an extensive programme of prospect scale mapping, surface sampling and geophysics, and resample the numerous outcrops and open pit operations. 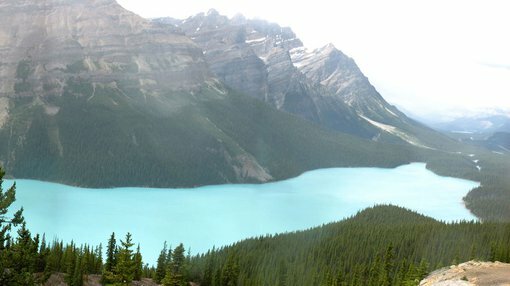 - An initial payment of C$50,000 and C$50,000 in MEI shares (at the 10-day VWAP prior to completion), and a 2% net smelter royalty. - Three additional payments of C$30,000, on the first, second and third anniversaries of completion of the acquisition. - C$30,000 in MEI Shares (at the 10-day VWAP prior to each anniversary). - Introduction fees of C$5,000 and 1,000,000 MEI Shares. The acquisition of the exploration rights over the Gillies Limit project claims is conditional upon MEI completing due diligence and receiving regulatory approval, while the company may terminate the agreement at any time.